The school consists of three (3) sites in Bonapriso area of Douala - next to the French Consulate, another site next to SNEC Douala, and a third site by Marché de Fluers de Douala. The school is setup to strictly comply and follow the standards set forth by the National Education board of France. It is headed by a Principal under the supervision and guidance of the Cultural counselor to the French Embassy in Yaounde, Cameroon. While the main language of instruction is French, the students are also given an opportunity to learn Spanish and German language. 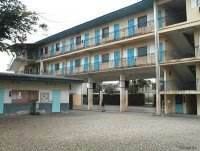 Ecole Dominique Savio School of Douala has over 1000 students of fifteen different nationalities in the Douala area. High School: 173 students in 11 classes. The Douala school was founded in 1972 by French government to educate children of its foreign citizens serving in Douala. The Dominique Savio school is an exporter of unadulterated French educational system to over 120 nations of the world. Noteworthy in the operation of the Domique Savio school system is the long standing tradition of active parental participation in the operations of the school. School Fees and Tuitions are set in Euros and range in the 3500.00 to 5500.00 Euros per academic year. Learn more about Cameroon's educational systems. Learn about the use of credit and debit cards and other form of electronic payments in Cameroon. Return to an overview of Douala, Cameroon Africa city.